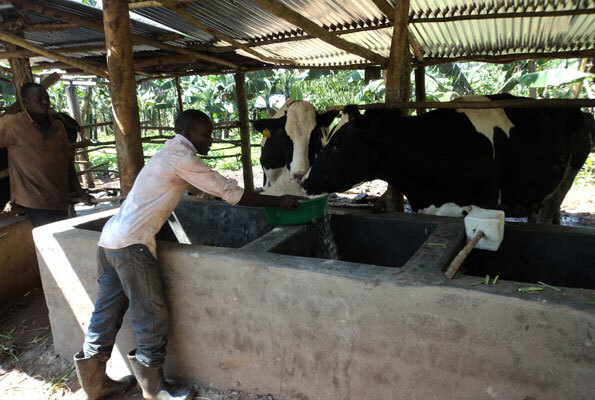 Lufuga feeding his Freisian cows with maize bran. I am Zaakaliya Lufuga. I am 18 years old. I completed my S4 last year at Nkoyoyo Day and Boarding SS at Matale in Buikwe District. After that, I did not think of joining A-Level but instead opted to go to an institute to pursue a course of my dreams. With little skills I had attained from my O- Level agriculture lessons, I decided to utilise my father’s land in the village by rearing cattle and growing bananas, a skill I want to improve to continue earning a living and support my family.